Here’s a look at the first section of the chapter on Randy Johnson’s 2004 perfect game. Enjoy! The history of perfect games is dotted with numbers. 27 up, 27 down. 1904. 1956. Cone’s numerologically correct 88 pitches. To this list, we can now add 40. That’s how old Randy Johnson was on May 18, 2004, when he wrapped up the 17th perfect game in baseball history, and the first pitched by someone with four decades of life under his belt. Striking out 13, the second most ever in a perfect game, Johnson shut down the Atlanta Braves 2–0 and cemented his already solid place as one of the top lefthanded pitchers the game has ever seen. Want more numbers? Johnson has them in spades. Also in 2004, he became only the third pitcher with more than 4,000 strikeouts, the most ever by a lefty. No pitcher ever, perfect game or not, has reached above The Big Unit’s 6 feet, 10 inches. His five Cy Young Awards, including four straight from 1999–2002, are the most behind Roger Clemens. He has more 300-strikeout seasons than any pitcher in history. He had three wins in the 2001 World Series, which helped him earn co-MVP honors with Curt Schilling. Some baseball experts thought Johnson had instead checked out after the 2003 season, when he pitched in only a handful of games due to two stints on the DL. The criticism continued as he started 2004 with a un-RJ-like 4–4 record into that May start against the Braves. Of course, a “bad” beginning to a season for Johnson would be a career year for most pitchers. Though he had lost those four games heading into his perfecto, he led the league in Ks/inning with more than 11 and opponents were hitting a paltry .156 against him, the lowest mark in the both leagues. The Diamondbacks’ first contract with Johnson, four years at $52.4 million, had paid off enormously for them, as he led them to their first championship in 2001. His second contract, a two-year $33 million job signed before 2003 was looking like a less-solid investment. But Johnson proved on that May night, and throughout 2004, that anyone who counted him out had counted too quickly. It was a hot and steamy Atlanta night when Johnson took the mound against the Braves. “With the humidity, you get loose pretty quick,” Johnson said. Johnson then struck out six of the next nine batters. Perhaps the most crucial at-bat of the game came in the second, when Braves catcher Johnny Estrada, the only Atlanta player to see ball three all night (only seven others even got to ball two! ), fouled off three straight 3-2 pitches before fanning. Estrada was the only Braves batter near the ball all night; he actually saw 22 pitches in three at-bats, nearly 20 percent of Johnson’s total of 117 pitches. Finally, Estrada swung and missed and the march to perfection continued. 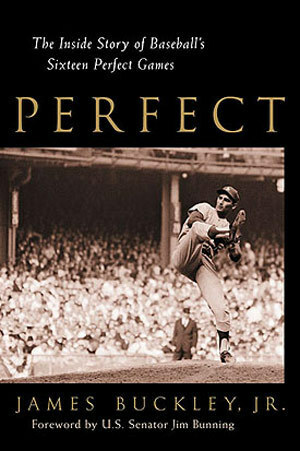 To read more, pick up a paperback copy of Perfect: The Story of Baseball’s 17 Perfect Games (Triumph, 2005).